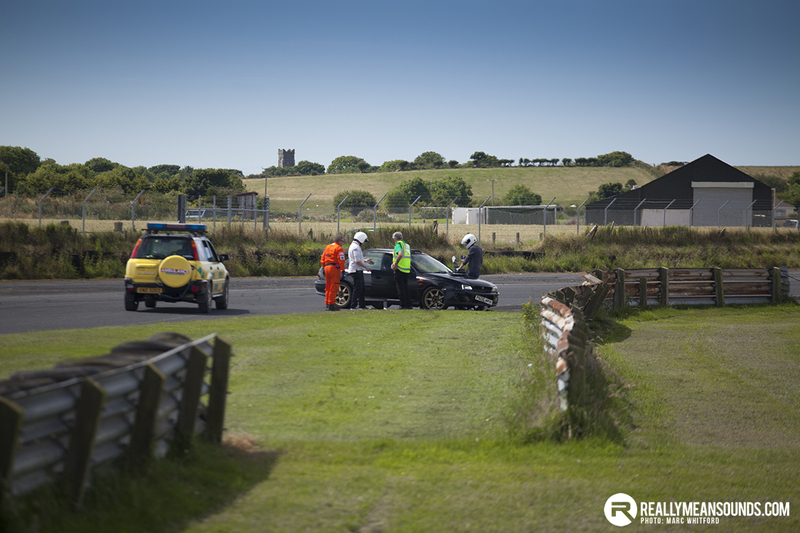 On Sunday 17th July we had one of our best days ever at Kirkistown Circuit. The weather was very good, as were most of the driving standards. There was a great turn out of cars and to cap it all, our caterers from The Quays, raised a ton of money for a local girl who needs life saving cancer treatment in America! Fel McIlroy, our Chief Marshal, summed our track day up on Facebook. Gareth Blaine brought 330 race car out for the first time. Gareth’s cars are always beautifully turned out and this car is no exception. It went as well as it looked. Gareth tells me that he fully intends to race the machine. Ralph Jess also brought one of these cars and throughout the day he took potential drivers round for quick laps. The intention is to start a class for them at Kirkistown, probably next year. It was a pleasure to welcome Justin Duff back two one of our days, after an absence of over six years. It is fair to describe Justin’s style of driving as extremely smooth. He has honed this style with years of experience around the Nordschleife in Germany. This time, he was in a BMW three series and he lapped anonymously and quickly as ever. Curiously, another Long time absentee made a welcome reappearance, albeit as a spectator, while sporting a cast on his arm as a result of a mountain bike accident. It was Nigel McGowan, also somewhat of a Nordschleife expert. I left the two of them discussing an upcoming trip back to The ‘Ring in September. Steven McKay brought his rally Cosworth Fiesta back for another go. Unfortunately, he is still having teething problems with this beautiful car. This time it was a power steering failure that brought his day to a premature close. 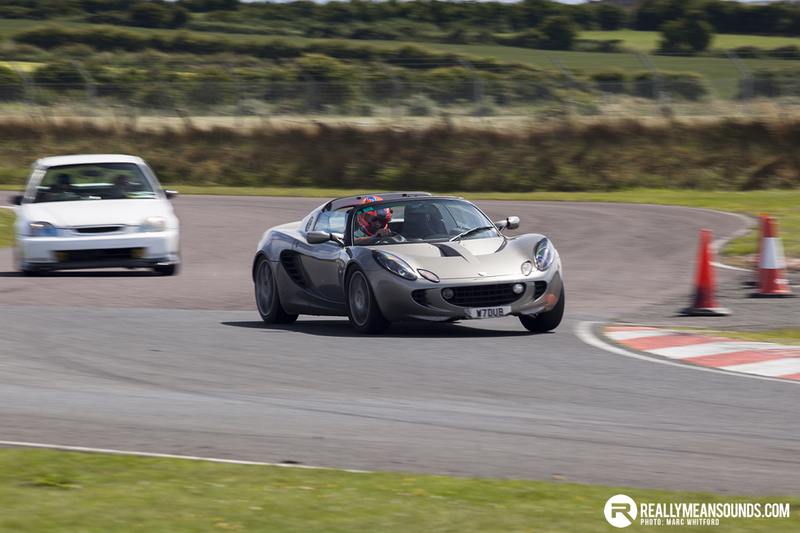 David Cousins, from East Engineering, had two of his well-prepared Mazda MX5s out this time. The #22 car ran like clockwork as usual. However the #33 car initially refused to run on any more than two cylinders. After a bit of fiddling back at the garage, the problem was solved and both cars circulated quickly for the rest of the day. 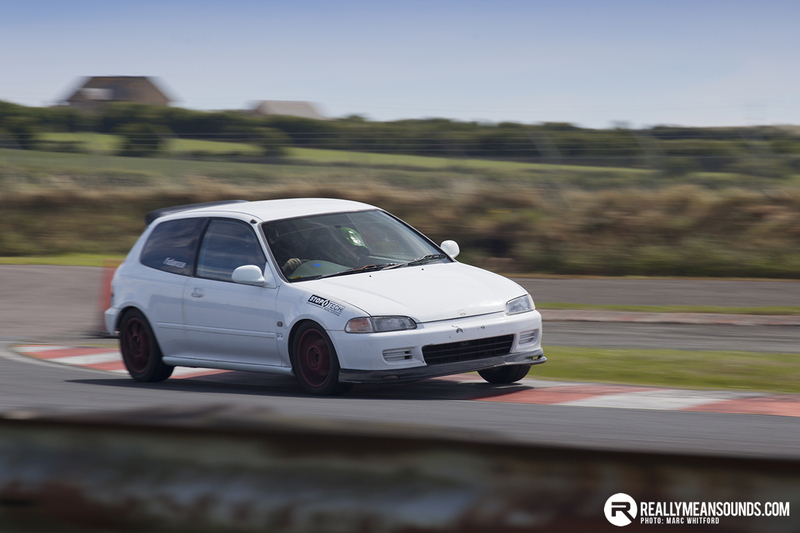 Gary McWilliams brought his very quick Toyota Starlet out once again and was very impressive. 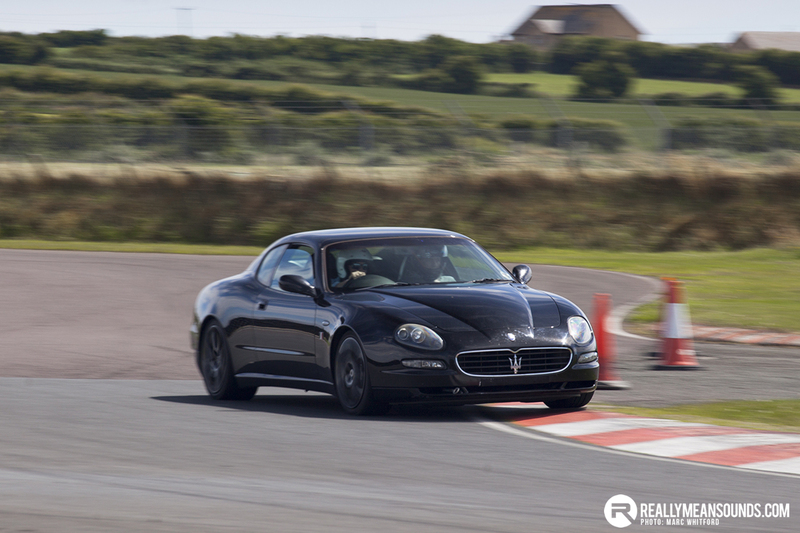 Terry O’Neill returned again with his beautiful sounding black Maserati 4200. This car makes a fantastic noise and yet it is not piercing. Terry is not afraid to push it on but then he does come from the NW200 Triangle Area. 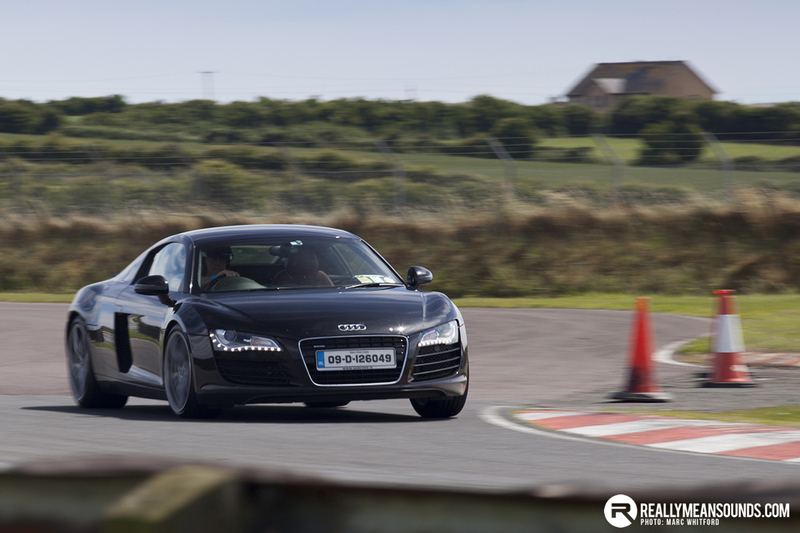 Another car making a fantastic noise was Tom Gaughran’s Audi R8. This was a delight both to the eyes and ears. Tom was meant to have a new Porsche Boxster 718 but the car is still in Germany. He hopes to have this machine at our next track day in August. We had a number of Toyota MR2s in attendance. A couple of older shape models seemed to rotate quite often. According to some video evidence submitted by East Engineering, the cause of these spins seems to be the presence of a Mazda MX5 in the rear view mirror! Joe and Ryan Weir, from Dungannon, were consistently quick in their V6 Sierra and BMW, respectively as was Barry Leeson in his Mini. Colin Irwin also lapped smoothly in his immaculate Focus ST.
One of the most interesting cars in the paddock and on track was Seamus Morris’s Darrian GTR. It seemed to be a work-in-progress situation throughout the day but the car was good to watch. Of the new participants, Owen Young went well in his Polo, after a few initial hairy moments under braking. Martin Portis, in another BMW 330, put in some very useful laps. Both Kenneth McKinstry and Colin McCusker piloted their Citroen Saxos skillfully. 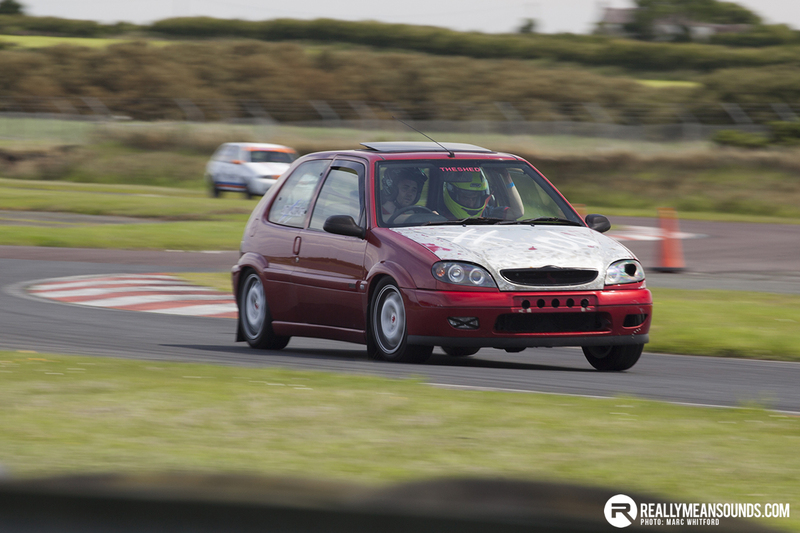 We had a number of hard luck stories, including the previously mentioned Cosworth Fiesta. The most impressive, for all the wrong reasons, was David Steenson’s Corsa. A steel rod decided to change route and exited through the block on his first lap! Ian Henderson’s Corolla developed rumbling bearings after the first session. Having quite a distance to drive home, Ian called it a day. Rob Gallagher also developed issues with his Westfield Megablade after a couple of sessions and David Morrisson had issues with his BMW 330. A number of Fiestas from the Kirkistown Zetec Series were in attendance. Jonny Forsythe, who is currently leading the championship, was lapping very quickly while Paul Sheridan and Eórann O’Neill seemed to be pushing each other, literally, along the straights. Brendan McIlvanna’s model was off the pace. It has an issue with rev limitation after 6,000. Ian Stewart’s Westfield was flying, as was Richard Kee’s model. It seems that gone are the days when we had a dozen of these machines making a regular appearance. Generally, in most cases, spectators stayed in safe places and so did the cars. On the one occasion when a car did hit a barrier, it was bare, which didn’t do the bodywork any good but reduced the risk of people being hit by flying tyres. The marshals did a great job in the heat and Philip Brookes helped with spectator control and rescue, as well as providing medical cover. Our next event is Sunday 21st August 2016. See you there! Don't know about anyone else that was there today but i am burnt to a crisp.. Aloe Vera on stand by!! Who out in the Red MG ZR / Rover 25? | Don't know about anyone else that was there today but i am burnt to a crisp.. Aloe Vera on stand by!! Who out in the Red MG ZR / Rover 25? Tell him I wasn't impressed with him attempting to hold me out on the coast road back into Ards when I was over taking him. I was driving the X6 (y) Ps not Yapping but I'm sure he was still in Race mode. Great weather today enjoyed it allow had an issue of oil starvation in the corolla by the looks of it but got her home safe and sound, baffled sump would be needed would it? | Great weather today enjoyed it allow had issue an of oil starvation in the corolla by the looks of it but got her home safe and sound, baffled sump would be needed would it? Loads of options, best being dry sump, but some baffles/ trap doors into the sump could solve your issues. Sometimes a slight overfill with oil can solve that problem. | Tell him I wasn't impressed with him attempting to hold me out on the coast road back into Ards when I was over taking him. I was driving the X6 (y) Ps not Yapping but I'm sure he was still in Race mode. He didn't see a grey jeep along side him and think he should lift the boot out? Anyway, no harm was done. I could see abit further ahead sitting up higher so maybe less blind to me. | Clio's still here, it will be going, I think....... Four cars and a van and there's only two of us, need to thin the herd and have a life, X needs a turbo again too after less than 2k miles :mad: Skint and pissed off, I'll try to do August or September, 1st world problems eh?! :) Mr2 sorted? Sorry to hear mark. What's the details on the wee Clio if it was to go down the road eventually?